Rep. Lori Saine’s mug shot. The probable cause statement says Saine’s arrest happened shortly after 1:45 p.m. The statement says a TSA agent spotted “what appeared to be a loaded firearm” in Saine’s bag. When TSA agents checked the bag, they found a 9mm semi-automatic handgun with four rounds in the magazine. There was not a round in the chamber, according to the statement. We’ll be interested to hear exactly what Rep. Saine told TSA agents when they found the gun in her bag. Did she assert something to make it clear she knew the gun was in her bag? Maybe a little “constitutional carry” bluster without realizing that wouldn’t help her legally? Either way it’s the biggest moment of either negligence or willful irresponsibility since Rep. Jared Wright left a loaded handgun in a House committee room back in 2014. Which you might recall was a career-ending screwup. Stand by for updates from Rep. Saine’s court appearance this afternoon. 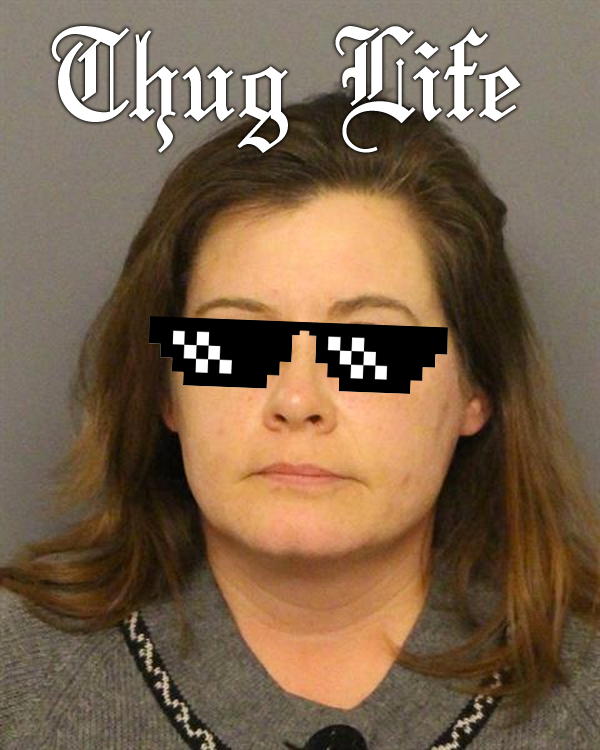 UPDATE #3: Denver Post reporting that Rep. Lori Saine was in custody as of 4:30PM. 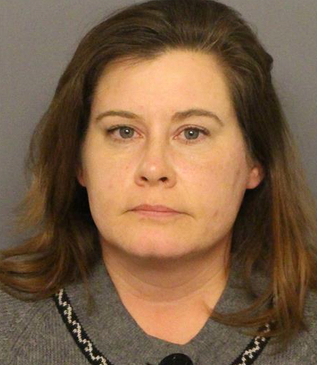 Court records and the Denver Police Department confirm Saine’s arrest, and DPD said the case will be forwarded to the district attorney’s office to determine if she will face charges. The pre-filed charge is a sixth-degree felony, introduction of a firearm into a transportation facility. As readers may know, Colorado lawmakers exploit a loophole in state law that allows them to carry concealed weapons inside the Colorado Capitol: despite the fact that citizens with concealed carry permits are not allowed to bring their guns inside the building, and despite the fact that the state capitol already has armed State Patrol officers protecting everyone inside. It would sure be nice if lawmakers would justify that privilege by being responsible with their guns. I thank god every day that she's my rep.
That felony is gonna make it hard for her to buy more guns. Better stock up! Maybe she had a permission slip signed by Steve Curtis? Maybe it was her artistic expression of her deeply held religious beliefs? Know what would have stopped this? Requiring an ID to vote. But we CAN'T EVEN CONSIDER THAT can we Democrats? Finally, a pol getting busted for something other than groping. Hey, you are all jumping the .. ahead here. maybe, she was on her way to/from legislative work. It's not like she was DWI with the gun rolling around in the car. artistic expression- dio is on the right track. maybe the U.S. constitution isn't gonna bend for some pointless and foolish state law or rule. Didn't the shirtless sheriff figure that out? maybe she was undercover for the Kansas police. Until she runs for governor, how we supposed to know? she is going to get a pardon anyway. It's not like she is colluding with Russians. besides, everyone does it, right? Then too, maybe it was just those damn twinkies again? . . .
What is Laura Bradford doing these days? Bradford is keeping a low profile in Grand Junction. Maybe if she repeatedly chants "Jesus" and clicks her heels together three times it'll all go away. Was she the nut case who broke into some kind of christian tirade on the House floor when they were giving a tribute to Bill Armstrong? YES! That was it! Thanks for sharing! I'm glad the state GOP keeps showing the importance of responsible gun ownership. Being armed to the teeth is just barely enough, amirite? Imagine the freakout if a Muslim male (or anyone dark-complected) had been carrying concealed at DIA. Even more fun will be had once Congress passes the pending legislation to allow reciprocity for concealed-carry permit-holders to carry concealed in other states. Her booking report. I hope she got a cellie who doesn't snore. It looks like she got in after dinner. I hope they weren't serving fried chicken; I know how much she enjoys that. Looks like she's scheduled for court today at 1:30. I read that DIA/TSA have confiscated about 90 guns in the last year. Given her position, I'm surprised they arrested and booked her into jail. She really must have given the TSA a lot of lip. If she wants to be a test case, I'm pretty sure she'll find out the hard way that her Second Amendment rights do not trump the rights of innocent travelers to a reasonable expectation of safety. The last thing we need is a religious fanatic/RWNJ taking potshots in a crowded terminal at "suspicious" characters because they don't look like they stepped off the set of Ozzie and Harriet. Well, I guess if one is going to make a fool of herself, might as well go all out. Hey Moderatus, what's your take on this? Really stunning – a loaded 9mm pistol at a DIA checkpoint. It's difficult (if not impossible) to believe she merely "forgot" it. What did she intend to do with it on a plane?! If you ever see her at DIA (or anywhere else), be very careful. And apparently she was held overnight without bond. Am I remembering correctly idiot legislators like her are allowed to carry concealed at the Capitol, even though no one else is? A disaster waiting to happen. What did she intend to do with it on a plane? No flight attendant would dare deny her a free bag of peanuts. Bradford, Wright and now Saine. It looks like Republican legislators can't be trusted with guns. Only 4 rounds in the magazine? Six rounds would be more believable. Maybe she's a secret believer of only a limited number of bullets being useful when defending yourself. Maybe she just came from the range and didn't take the time to clean and secure the weapon fully. Or maybe the bullets had names on them. Sheriff Andy Taylor giving Deputy Barney Fife a gun but no bullets makes a lot more sense these days. What are "pre-filed" charges, as mentioned in the article? Sounds like charge(s) under which she was arrested and booked into jail. The presumptive charge(s) against her— in this case, a violation of CRS 18-9-118. The DA will decide what to formally charge her with (for better or worse, crazy and stupid is apparently not a crime here) at her arraignment. Clearly she made a mistake but was anyone hurt? Don't use an isolated mistake to attack constitutional rights. You'll lose every time. It doesn't matter, because the law she was arrested for violating doesn't require anyone to be hurt. We're just enforcing the laws we have, like the gunnuts are always telling us to. Yeah. I remember when we could carry firearms onto airplanes. How do you think constitutional rights should apply to mass shooters? Another GOP felon. It's barely even newsworthy anymore. You mean the non-existent constitutional right to schlep a handgun into an airport? Do your Second Amendment homework, Moddy. Start by reading Heller. Guess the TSA better stay on their toes. Rocky Mountain Gun Owners has donated over $2300 to Lori Saine over her last few elections.